Recently purchased a new PC or thinking of getting one? Well, if you are in possession of a new PC, then the PC Decrapifier is an excellent tool for users wishing to remove the 'crap' that is bound to be preinstalled on most new Windows-based systems. 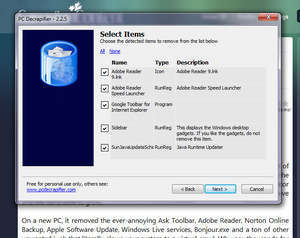 The creator of this program lists over 50 different applications that the PC decrapifier can remove and the list is sure to grow. On a new PC, it removed the ever-annoying Ask Toolbar, Adobe Reader, Norton Online Backup, Apple Software Update, Windows Live services, Bonjour. Version 3.0.0 is a freeware program which does not have restrictions and it's free so it doesn't cost anything. For security reasons, you should also check out the The PC Decrapifier download at LO4D.com which includes virus and malware tests. Additional screenshots of this application download may be available, too. The PC Decrapifier has a presence on social networks. The PC Decrapifier download been highly rated by our users.